Phu Quoc island is the largest island as well as the largest island district in Vietnam located off the coast of Kien Giang province. 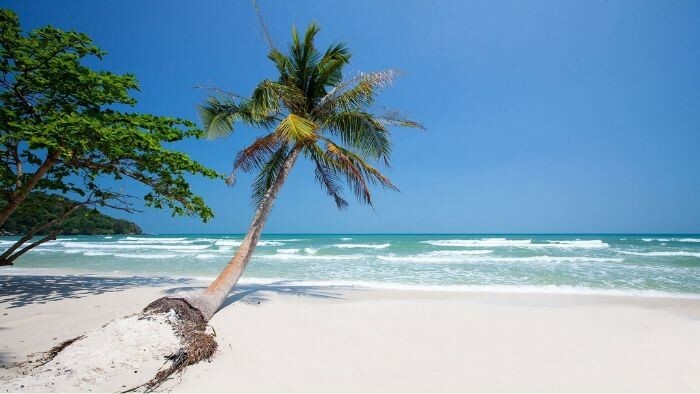 Surrounded by the blue sea, Phu Quoc features a lot of beautiful beaches, and some of them are ranked on the list of top most beautiful beaches in the world. 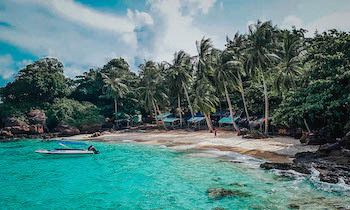 Phu Quoc, also known as Dao Ngoc or Pearl island, is the largest island in Vietnam as well as the largest of the 22 islands in Phu Quoc island district, located in the Gulf of Thailand. Phu Quoc island together with other smaller islands creates Phu Quoc island district under Kien Giang province. The island district has a total area of ​​593.05 km² which is approximately the area of Singapore. Duong Dong town is the capital of the island district located in the northwest of the island. 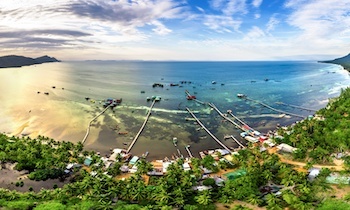 Phu Quoc island is distant 120 km from Rach Gia city and 45 km from Ha Tien town. 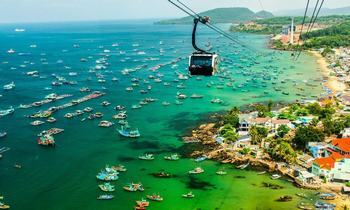 Long beach is located next to Tran Hung Dao Street running along the southwestern coast of the island. Long beach is one of the beautiful beaches in Duong To commune. Called Long beach because the stretch of beach stretching nearly 20 km from Dinh Cau cape to Tau Ru. Long beach is divided into many small beaches connected by rocky rapids, green trees, and fishing villages. This is the first beach most the tourists will see when coming to Phu Quoc. There is a chain of hotels and resorts along the beach, so this beach is consequently the loudest and most hectic one at night. 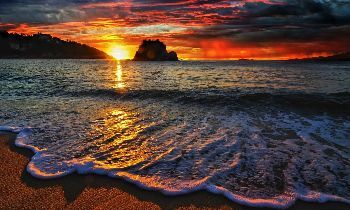 Covering over a half of western coast of Phu Quoc island, Long beach is the most suitable place for tourists to charm the sunset. Considered to be the most beautiful beach in Phu Quoc, the sandy beach in Sao beach is not as yellow as Nha Trang beach, or dark brown like Vung Tau sea, which is pure white and smooth like ice cream. Sao beach is located in the affectionate arms of two gentle mountain ranges to bring quiet space and fresh climate for visitors. The water is as transparent as glass, so you can imagine yourself at the end of the Earth. Khem beach is also called Kem beach, this beach, as well as other beautiful beaches of Phu Quoc, has white and smooth sandy beaches. A special thing at Kem beach that impresses tourists is the shape of a bow-shaped beach, lying quietly and peacefully between two deep green forests. 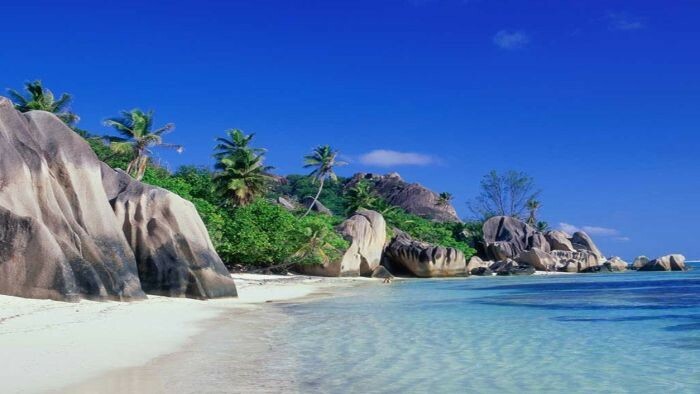 With a name that literally means “Cream beach”, Kem beach is located in the south coast of Phu Quoc. This beach is also a military zone, so it is limited for tourists to visit for years. Ong Lang beach is not stretching like other beaches, it is interrupted and blocked by rocks. 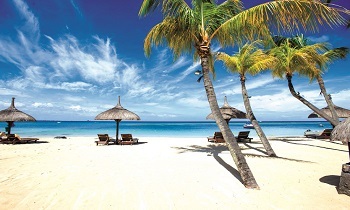 Coming to Ong Lang beach, you will have many opportunities to sip cool drinks, massages and sunbathing on the couches. 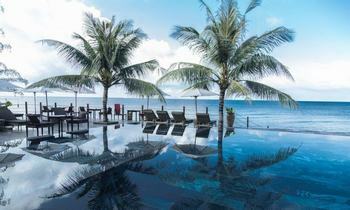 After Long beach, this is one of the most developed beaches in Phu Quoc, Ong Lang beach has some luxury resorts such as Ong Lang Resort and Spa, Chen La Resort and Spa, whereas the Mango Bay Resort is the most highlight one here. Located in Ham Ninh fishing village, this beach is in the shallow water zone. When the water was low, the sand was immense and ran far away, while the water was rising to flood the beach till the edge of the forest. 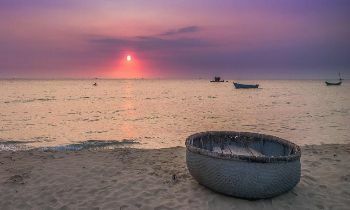 Come to Vong beach in the early morning or moonlit nights to enjoy the beauty of Phu Quoc beach. Vong beach sometimes swarms with the motorbike and touts but it is still a wild and beautiful beach where you can forget your cares. Ganh Dau beach is a beautiful beach in Phu Quoc with very clear water, so seafood here is rich and extremely fresh. Ganh Dau used to be a military base, but now it is open to welcome tourists by the military. Located on the northwestern coast of Phu Quoc, you can see Cambodia from Ganh Dau beach. For those who are interested in the history, there is a shrine on the beach where people built to worship a Vietnamese independence fighter. 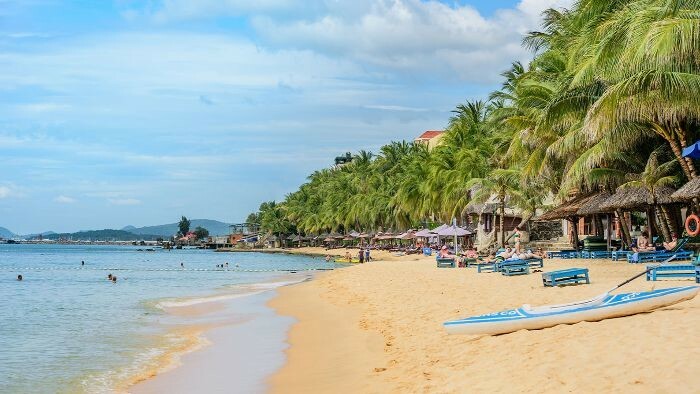 The sand in Thom beach is darker than in other beaches in Phu Quoc, but together with the mountain scenery here, you will be overwhelmed when arriving. Especially when coming to Thom beach, you can cross a sea road about 100 meters to discover the unspoiled Hon Mot island filled with purple sea lily flowers. In the past, this was a restricted military base, now the beach is a tourist mecca that is a place you should visit before being too late. In the past, if you wanted to access to Thom beach, you would have shown your passport to get through the entrance, but those days are over, you can freely visit Thom beach to enjoy the natural beauty of it now. Located on the northern part of the island, Rach Vem is a relatively small and quiet fishing village. There are a few secluded beaches along the coast commonly called Rach Vem beach, this area has been predetermined for projects to build resorts with modern equipment worth millions of dollars. This is the only beach left with the unspoiled nature of Phu Quoc with houses of Cambodian people. 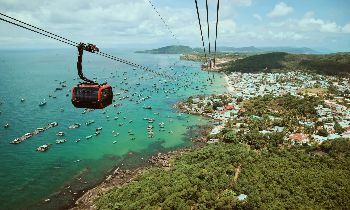 Isolated from the world for decades due to wars and political problems, Phu Quoc now opens to welcome tourists from all over the world to enjoy and discover the unspoiled beauty of nature and people here. 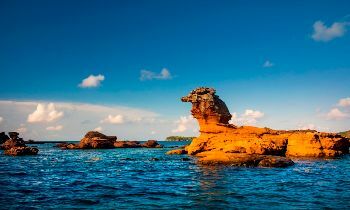 If you need further information about Phu Quoc, don’t hesitate to contact us. Thank you!